The US Missile Defense Agency said a medium-range ballistic missile was successfully intercepted over the Pacific in the early hours of Sunday morning, in a test of the Pentagon’s Terminal High Altitude Area Defense (THAAD) System battery in Kodiak, Alaska. The test came the same day that two US supersonic B-1 bombers flew over the Korean Peninsula, following joint military drills with Japan, in a show-of-force response to North Korea’s test-fire of what Washington deemed the isolated nation’s second intercontinental ballistic missile on Friday. The Russian Ministry of Defense said the missile was a medium-range ballistic missile, "based on its technical characteristics." Meant as a “stern warning” to Washington, according to North Korean state media, Friday’s launch aimed for “maximum distance.” The People’s Democratic Republic of Korea (DPRK) leader Kim Jong-un was cited as saying that the test reaffirmed the country’s ability to range the “entire” US mainland with its weapons, the Guardian reported. The Pentagon denied that the launch posed a threat to North America, but in a telephone conversation after the test, representatives from the US and South Korean militaries discussed “military response options,” according to the Pentagon. Sunday’s THAAD test saw the detection, tracking and interception of a target missile air-launched from a US Air Force C-17. Soldiers from the 11th Air Defense Artillery Brigade, stationed at Texas’ Fort Bliss, conducted the operation, in a test that mimicked a real-world scenario as closely as possible, according to an MDA statement. The brigade was not made aware of when the target would be launched. 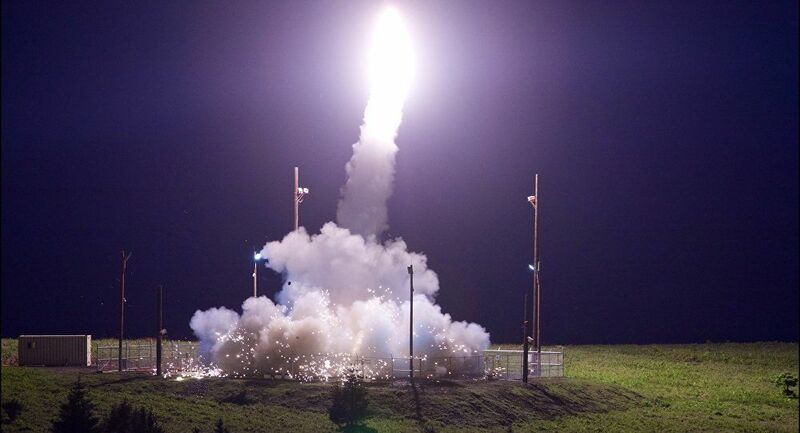 “In addition to successfully intercepting the target, the data collected will allow MDA to enhance the THAAD weapon system, our modeling and simulation capabilities, and our ability to stay ahead of the evolving threat,” MDA head Lt. Gen. Sam Greaves said in the statement, cited by Stars and Stripes.